Happy New Year! 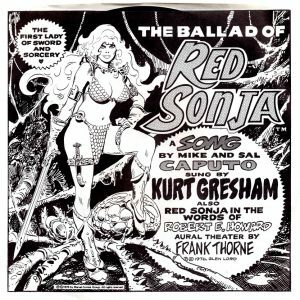 Welcome to the third installment of an occasional feature called “It Came From the Bad-Girl Archives,” in which I shine a spotlight on some out-of-print and possibly long-forgotten comics that starred the sort of scandalous (and sometimes Not Safe For Work) female leads who have always reaped a goldmine in profits for comic-book publishers. Think the 1990s’ “bad-girl era” was the only time these femmes fatale became popular? That’s just the tip of the iceberg! In part one of this series, I introduced you to the Eros Comix one-shot Betty Being Bad, a comic-length autobiographical essay by acclaimed writer/artist/letterer John Workman, highlighted by a collection of black-and-white photos of 1950s pinup icon Bettie Page in various stages of undress. In part 2, it was Chopper #1–2, the tale of a motorcycle-riding headless horseman crossing paths with a drug-dealing high school cheerleader, written by Martin Shapiro, illustrated by Juan Ferreyra, and published by Asylum Press in 2011. 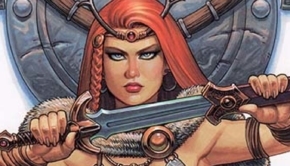 The creation of Conan the Barbarian author Robert E. Howard, Sonja, through the collaborative efforts of Marvel Comics writer/editor Roy Thomas and artists Barry Windsor Smith, Esteban Maroto (who designed her iconic “chain-mail bikini”), and Frank Thorne (especially Thorne’s), rose to become one of the most popular sword-and-sorcery heroines (if not the most popular) in 1970s comics, and she still has her legions of fans. And although not a great deal of merchandising was generated by Marvel during the height of Sonja’s popularity—their female characters were never as popular as Spider-Man, Captain America, or the Hulk—Frank Thorne was a creator who knew how to connect with a growing fanbase. It’s…not exactly the catchiest of tunes, is it? The dull, trying-to-make-this-sound-important tone and mismatched harmonies between Gresham and his backup singer toward the end don’t help matters, either. Maybe it could have worked as a power ballad from a 1980s hair-metal band like Whitesnake (perhaps with Tawny Kitaen dancing around as Sonja in the music video? ), but as an acoustic number it just falls flat. 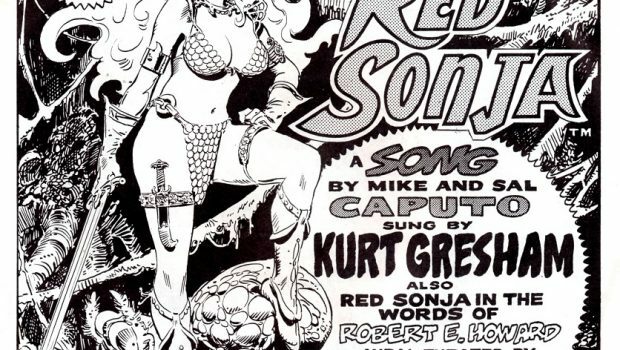 The B side is “Red Sonja in the Words of Robert E. Howard—Aural Theatre,” a recording of Thorne in his wizardly performance voice, as he does a dramatic reading sans musical accompaniment. Thorne does a nice job, but some things, like pulp-era prose or Frank Miller’s Mickey Spillane–esque dialogue in a Sin City comic, should never be read aloud. It just sounds ridiculous. Bottom line? 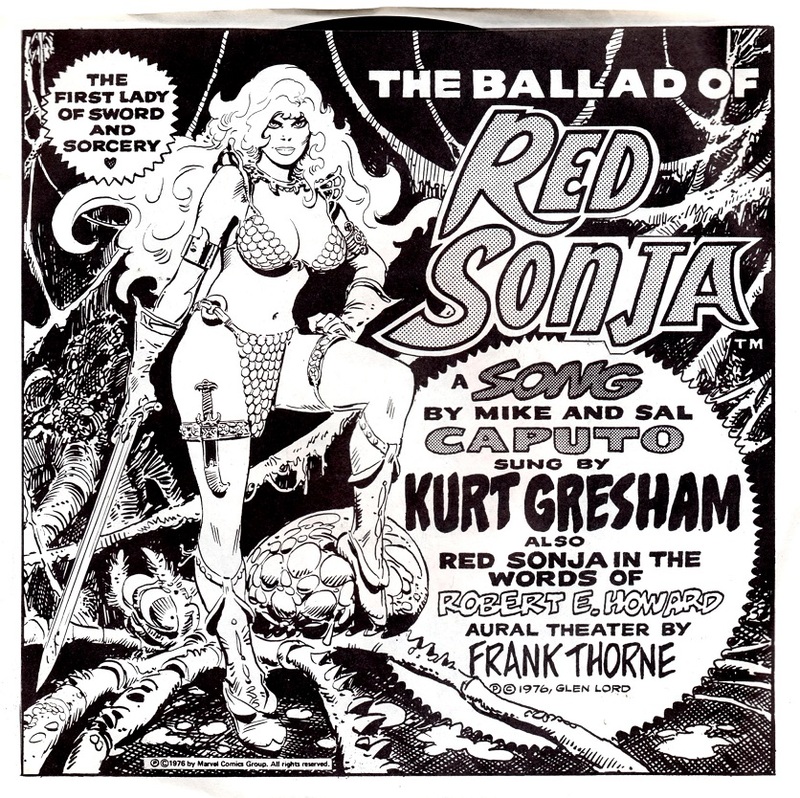 As an artifact of fandom, “The Ballad of Red Sonja” is a strange piece of work, intended for comics fans but performed at a New Jersey bar for patrons who probably had no idea (or who really cared) what this thing was—although I’m sure Ms. Trouvere’s presence onstage (as you can see from the back-sleeve photo) probably helped them tolerate the awful song. I mean, honestly, I only bought a copy—from Thorne himself, at a late 1980s convention—because of the illustration Thorne did for the sleeve.